Born in 1940, Alden spent the early part of his life on the family farm in Elderbank, Nova Scotia. He began working in the construction industry in Halifax and later became involved with sales and marketing of precast concrete buildings and bridges through the Maritime Provinces of Canada. During his travels, Alden often came across many various types of artwork that he would relish. His interest in creating things with wood and concrete started to develop around the mid 90’s. One day his brother brought him his first pine logs and suggested that he try carving something with the chainsaw. He started with several large carvings of people. By painting the features with vibrant colors it brought out their true character. 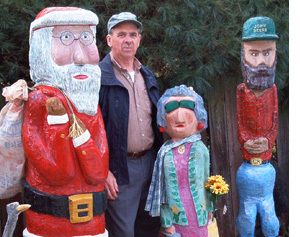 Alden has created a wide variety of folk art chainsaw figures including a bear, a farmer, as well as a Scottish bagpiper and drummer. Other works include free hand concrete sculptures of a Newfoundland fishermen and several prehistoric stone age people in their natural setting. You can see a picture of one of these pieces by clicking here. 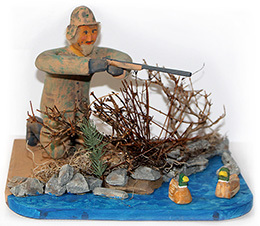 Alden’s uncle Elmer Killen was also a folk artist who inspired him to try smaller wood pieces in different settings such as hunting and fishing as well as family related farm life and how people are connected with the land. Each carving has a setting or story to give it meaning and life. Alden has always had a great interest in family and historic community events. 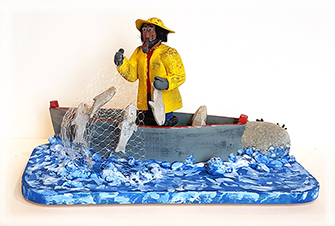 Some pieces of his work are on display at the Shubenacadie Canal, Fairbanks Centre, on Locks Road in Dartmouth, Nova Scotia, depicting life on the canal during its construction in the 1830’s.